An increasingly large number of Americans have damaged or missing teeth that cause irritation and affect eating, speech, and oral hygiene. Dental implant surgery is an option that, for many patients near New Cumberland, can replace decaying and severely damaged teeth with strong and sturdy artificial teeth that are securely fastened to the jawbone itself. Patients that are missing teeth have relatively few options. They can live without an artificial replacement and deal with the repercussions the rest of their lives, replace the missing teeth with full or partial dentures, or get a simple dental implant surgery to supplant the damaged or missing tooth with a natural-looking replacement. Dental implants offer peace of mind and convenience that removable dentures do not. By fusing to the jawbone, the dental implant that holds the tooth in place will not fall out or move around. Artificial teeth also will not decay and can be removable or permanently attached. A dental implant is a metal post, also known as a screw or anchor, that is surgically attached to the jaw to act as the root for your new artificial replacement tooth. The post serves as a stabilizer to hold the new tooth in place more securely than a crown or set of dentures. 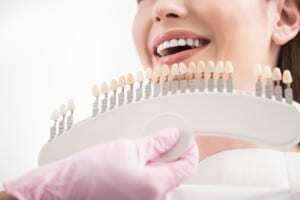 Patients who receive dental or denture implants can expect to regain full function of their teeth without having to worry about dislodging or damaging the implant. At American Dental Care of Harrisburg, PA, we hold our dental surgeons to the highest standards of practice and patient care. With a team of dentists who genuinely care, our patients trust us to provide exceptional service with a personal touch that sets us apart from other denture implant practices near Bressler, PA.
Our surgeons are experienced in a range of procedures from emergency dental care service to dental veneers and more which aid them in providing the most pleasant and convenient visits possible. When you arrive for your dental implant surgery, you can expect a comfortable and relaxing experience. Our dentists and dental assistants take the time to explain the work before they begin, so you understand what is being done and why. We listen to our patients and do everything in our power to maximize their comfort while under our care. We continually maintain the highest standards of patient care by utilizing the latest equipment and techniques in the industry. With state-of-the-art technology and cutting-edge dental procedures, our team continually strives to improve our practices to make each visit better than the last. Find out why so many patients from Bressler and New Cumberland are coming to our office to restore their smiles with dental implant surgery. Book your appointment online now or give us a call at 717-279-5242 to discuss treatment options. Your smile is important to you. Don’t settle for anything less than exceptional dental care.